The Palau Montaner, home of Lluis Domènech’s publisher brother, was begun in 1889 by Josep Domènech i Estapà in a sober eclectic style. However, it was finished with pizzazz by Lluís, who frosted the top floor with mosaics by Gaspar Homar and showered decoration on the grand stair, with a lovely stained glass skylight by Joan Rigalt and sculptures by Eusebi Arnau – if you’re wondering where the usual dragons are lurking, they’re at the bottom of the steps. 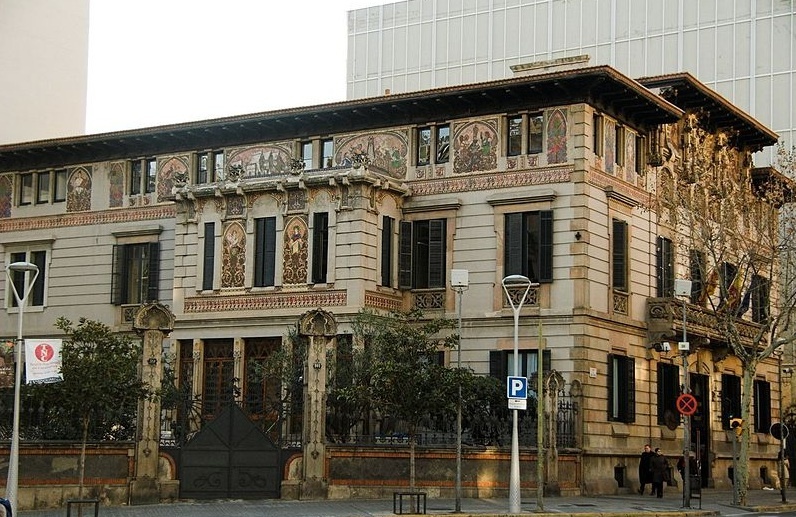 The building is now the seat of the Delegació del Govern a Catalunya – Madrid’s representatives in the autonomous region (as some jokingly call it, the 'Spanish Embassy'). Nearby at No.283, the neo-Pompeiian Palau Cascades, with a rare façade inset on a xamfràn to allow for some palm trees in front, was designed in 1883 by Antoni Serra i Pujals. It now houses the local lawyers’ college.